James J. Jenkins, fondly known as J3, was one of a group of World War II era psychologists who changed psychology. He began as an I-O psychologist at the University of Minnesota, but was drawn to more experimental endeavors. Jenkins helped to foster psychology’s “cognitive revolution.” His role in this started with the Social Science Research Council’s 1953 summer research conference that helped establish psycholinguistics as a discipline. 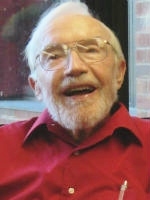 Then in 1964-65 as a Fellow at the Center for Advanced Study in the Behavioral Sciences, Jenkins became convinced that the concepts of the “mediation theory” of language that he had been promoting would not suffice to explain language development and that a different conception of “how the head works” (a favorite phrase) had to be found. He was flexible in his approaches, always trying to solve the problem rather than advance a particular theory. His work advanced multiple research areas: learning, memory, sentence processing, aphasia, speech perception, and perceptual organization. He and his students examined associative mediation, memory for sentences, rule-governed generative behavior, and speech perception. In the latter, Jenkins sought to understand how one can perceive a particular vowel despite enormous variation in the acoustic signal across speakers. He and colleagues determined that the key structural invariants were dynamic and relational ones—a contextual functionalism. Jenkins’ main collaborator in speech perception work was the outstanding investigator, Winifred Strange. Jenkins served as the American Psychological Association (APA) representative to the National Research Council, Chair of the Psychonomic Society Board of Governors, President of APA’s Division of Experimental Psychology, Chairman of the APA Board of Scientific Affairs, and President of the Midwestern Psychological Association. Many honors also came his way, including Outstanding Alumni Achievement Awards from William Jewell College and the University of Minnesota, and being named Distinguished Research Professor at the University of South Florida. But the contributions he most treasured were the successes of his students and colleagues. Jim Jenkins had an enormously positive impact on those around him. His view that science was not a zero sum game of competition, but a team effort, made him highly successful as the Director of the Center for Research in Human Learning and later Director of Training (1965-1982). Students flocked to him. In his 32 years on the Minnesota faculty, he supervised 46 doctoral students. He moved to the University of South Florida (USF) in 1982 where he mentored an additional 36 doctorates before retiring in 2000. Jenkins was a generous and inspirational leader who drew the best from all around him, and helped all to work together in mutually supportive and creative ways. His influences on each person long persisted. He found joy in fostering others’ research, and he felt personally rewarded by their successes. Jenkins’ remarkable combination of abilities led to nearly 200 scholarly publications, multiple leadership positions, teaching awards, professional accolades, and intense devotion from generations of students, some of whom are also honored by FABBS Foundation. * The FABBS Foundation would like to thank Drs. Donald J. Foss and J. Bruce Overmier for nominating Dr. Jenkins for this honor and for leading the effort to spread the word about his nomination. Would you like to honor Dr. Jenkins? It’s not too late to have your name added to the list of donors! You can make your donation to Dr. Jenkins’ In Memory Of… campaign at anytime.